The Sonata 6680C was a most pleasant surprise. We think this machine is more fun to operate than any other machine that we now have. In fact, if we had a grandchild that we wanted to give a machine to, this would probably be our first choice. It has lots of capabilities that would stimulate creativity and keep them occupied for hours/years. When we brought the machine home from a thrift store, it wouldn't run. Since it was an electronic model that we had zero experience with, we wondered if we had done the right thing. Luckily, the problem was isolated to a loose wire in the foot control. Jim knew he was on the right track for finding the problem when he shorted the foot control leads together and the motor ran at max speed! Our dog-eared manual indicates that service for the machine can be obtained at Jo-Ann Fabric Center. However, when we asked our local store about the machine we got a "deer-in-the-headlights" look so we assume that the machine is older than the clerk. If anything electronic goes wrong with the machine, it will probably become irreparable. 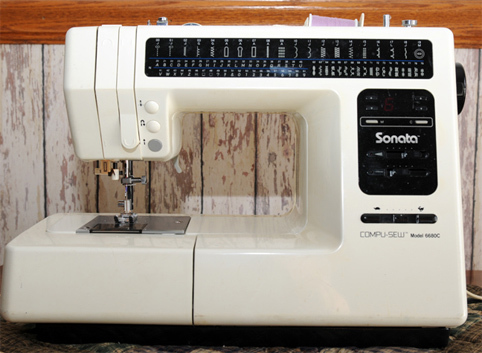 The Sonata is a free-arm machine making it good for sewing cuffs or sleeves. 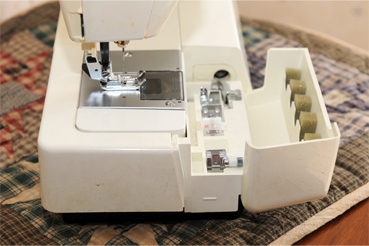 The removable bed contains an accessory tray and bobbin storage. The machine has many accessories and features that we probably never will learn to use. We know nothing about the machine's pedigree or date of manufacture. Rear of the Sonata is fairly plain. It is not easily seen here, but the machine has a novel aid for needle threading and operated by one of the sliders on the machine's faceplate. The machine has a very helpful folding carrying handle. If we have any complaint with the machine, it would be with the location of the presser foot lever. The front panel of the machine shows stitches that can be sewn by the Sonata 6680C, however, the panel doesn't show the stitches above so we have included them here. 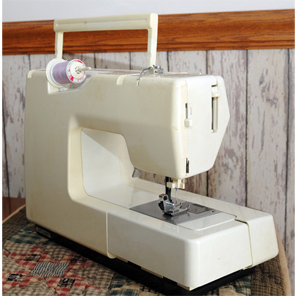 Additionally, the machine can sew letters and the manual will be required to determine what the appropriate code is. The lettering is all caps and, in our view, not very exciting.